We are so certain you will be happy with Glutimax, we guarantee it! 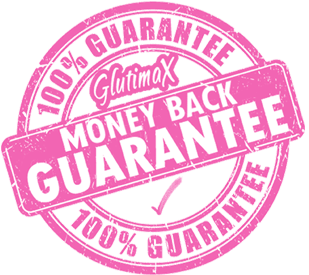 If you are unhappy with Glutimax for any reason, send it back within 30 days for a full refund (Less S&H).... No Questions Asked! Your satisfaction is always our #1 priority. That is why our program is backed by this guarantee! We stand by our product and are sure that you will achieve the desired results you are hoping for. Glutimax has a 3 year shelf life. You can be certain that the product you receive is fresh and newly manufactured. The product's date of manufacture is stamped on each unit. Try it now which is, as always, backed by our risk free guarantee.